The Legendary Starfy universe (伝説のスタフィー, The Legendary Starfy) is a "marine action" series with common elements of platforming developed by TOSE and published by Nintendo. The series began on September 6, 2002 with Densetsu no Stafy for the Game Boy Advance, and four sequels were released. The Starfy games were released only in Japan for its first seven years, until the international release of The Legendary Starfy on June 8, 2009. Official artwork of Starfy in Brawl. Starfy, the series' lead character, appears as an Assist Trophy in Super Smash Bros. Brawl. When summoned, he will perform his trademark Star Spin attack, which can inflict up to 11% damage, but has no knockback properties. However, if Starfy takes a significant hit, he will explode and be knocked far away. If an opponent is in Starfy's trajectory when he is flying away, they will be temporarily stunned, and then sent reeling at the same angle with high knockback and damage. Starfy and his sister Starly are available as collectable trophies. Note that Starfy and Starly are known by their Japanese names "Stafy" and "Stapy" throughout their trophies (in both the NTSC and PAL versions of Brawl), as a Starfy game had not yet been released outside of Japan when Brawl was released, and that Starfy/Stapy is oddly categorised as "Fighter Related", the only character from a universe with no playable character to be so. Stafy's younger sister, known for her jumbo pink ribbon, and princess of a floating kingdom. Stapy has a bold nature that contrasts her reserved brother. Though she is younger, Stapy is often the spark that motivates the sometimes spineless Stafy. Only Stapy can perform Wall Jumps, High Hats, and High Hat Spin Jumps. For an unknown reason, Stapy has a Kansai accent. Starfy returns as an Assist Trophy in Super Smash Bros. 4. He appears to be unchanged from his appearance in Brawl. Starfy also appears as a trophy in Super Smash Bros. for Nintendo 3DS. 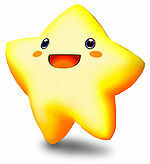 Starfy is the absentminded prince of the Pufftop Kingdom, and the hero of The Legendary Starfy. Is he a star? A starfish? His commitment to helping you when summoned is obvious, even if his species isn't. He'll use a Star Spin attack, which isn't all that powerful. It's the thought that counts! Starfy: Returns as an assist trophy. Wikipedia has an article on The Legendary Starfy (series). ↑ 伝説のスタフィー (2002) official mini-site.